Vertigo is a symptom of illusory movement. It must be differentiated from other causes of dizziness, such as light-headeness and unsteady gait or disequilibrium. Vertigo is most commonly described as a spinning sensation of either oneself or the environment, but it can also be described as a sense of swaying or tilting. Vertigo arises from damage to or dysfunction of the labyrinth, vestibular nerve, or central vestibular structures in the brainstem or cerebellum. The causes of vertigo can be organized into peripheral and central etiologies. Up to 80 percent of causes are peripheral, with benign paraoxysmal positional vertigo, vestibular neuritis and Meniere’s disease the most common causes (Kroenke 2000). Benign paroxysmal positional vertigo: BPPV, the most common cause of vertigo, is thought to be caused by free-floating debris within the posterior semicircular canal (Furman 1999). This condition presents as sudden onset of vertigo following changes in the position of the head. Vestibular neuritis:Sometimes referred to as labyrinthitis, vestibular neuritis is thought to be a viral or post-viral inflammatory disorder affecting the eighth cranial nerve. It is characterized by rapid onset of severe vertigo, nausea, vomiting, and gait instability lasting a few days, followed by gradual resolution (Balch 2003). Meniere’s disease:Meniere’s disease should be suspected when patients present with vertigo, tinnitus, hearing loss, and ear fullness. Meniere’s disease is caused by excessive endolymphatic fluid. Ramsay Hunt syndrome:Ramsay Hunt syndrome is caused by activation of herpes zoster in the geniculate ganglion. It is characterized by acute vertigo, ipsilateral facial paralysis, ear pain, and vesicles in the external auditory canal or on the auricle. Perilymphatic fistula: Perilymphatic fistula is characterized by vertigo that is worsened by sneezing, coughing, lifting, or loud noises. Cogan’s syndrome: Cogan’s syndrome is an autoimmune condition that affects the eye and ear. It is characterized by Meniere’s syndrome-like attacks in which the vertigo is described as objects jiggling back and forth. Acoustic neuroma: Most acoustic neuroma patients do not experience significant vertigo. They are more likely to present with unilateral hearing loss and/or tinnitus. Aminoglycoside toxicity: This condition is most common with gentamicin, and it results in usually permanent damage to the hair cells of the inner ear without affecting hearing. Most patients don’t experience vertigo since both ears are affected equally, but they do have chronic disequilibrium and the sensation of objects jiggling about. Migrainous vertigo:This condition should be suspected when attacks of vertigo are associated with migraine headaches or visual aura, photophobia, or phonophobia. Brainstem ischemia: Brainstem ischemia, which is due to embolic or atherosclerotic occlusion of the vertebrobasilar arterial system, should be suspected in patients with vascular risk factors and other neurologic deficits. Cerebellar infarction and hemorrhage: This condition usually results in sudden, intense vertigo associated with limb ataxia. It is usually seen in older patients with diabetes and hypertension. Multiple sclerosis:Multiple sclerosis results from plaques near the vestibular nuclei and in the root entry zone of cranial nerve VIII, resulting in peripheral vestibular symptoms (see below) or plaques in the brachium conjunctivum and cerebellum, resulting in central vestibular symptoms (see below). The history can distinguish vertigo from other causes of dizziness and can distinguish central from peripheral etiologies of vertigo. When patients present with complaints of dizziness, clinicians should ascertain what the patient means by dizziness. Dizziness is often used to describe light-headedness, vertigo, or unsteady gait, so getting the patient to describe exactly what he or she is experiencing is critical to making an accurate diagnosis. Vertigo is a sensation of spinning, while light-headedness is a sensation that one is about to pass out when one stands from a prone or sitting position. Classically, vertigo is separated into peripheral and central causes. Associated symptoms, time course, and aggravating and provoking factors can usually differentiate central from peripheral etiologies. Severenausea is more common withperipheralthan central lesions.Centraldisorders impairgait andposture to a greater degree than peripheral disorder does. Thetime courseof symptoms may provide the best clue to the underlying cause of vertigo. Vertigo that lasts less than one minute is usually related to BPPV, while prolonged episodes of vertigo that last for days usually occurs with vestibular neuritis, multiple sclerosis, and infarction of the cerebellum or brainstem. Single episodes of vertigo that last minutes to hours is usually due to migraine or TIAs, while recurrent episodes that last the same amount of time are usually related to Meniere’s disease. All vertigo is worsened by head movement; if it is not, consider another cause of dizziness. Vertigo that is worsened by coughing, sneezing, or exertion suggests a perilymphatic fistula. Associated neurological symptomssuggest a central etiology of vertigo. Vertebrobasilar stroke symptoms include diplopia, dysarthria, and dysphagia. Multiple sclerosis may be accompanied by associated neurological symptoms related to the location of demyelination. Visual auras accompany migrainous vertigo. Deafness andtinnitusmay be present with peripheral disorders but are absent with central disorders. The physical exam is used to confirm vestibular dysfunction and to differentiate peripheral from central causes of vertigo. Nystagmus is rhythmic movement of the eyes that can be detected when the patient looks straight ahead. Inperipheral disorders,the fast phase of nystagmus (slow drift of the eyes away from the target, followed by fast correction) is toward the normal ear. The nystagmus is horizontal and can be suppressed with visual fixation. In contrast, incentral disorders, nystagmus can’t be suppressed and can be in any direction. The Dix-Hallpike maneuver, which tests for canaliths in the posterior semi-circular canal, should be performed when BPPV is suspected (Figure 1). With the patient sitting and the neck extended and turned to one side, the patient is rapidly placed in the supine position with the head hanging over the edge of the bed. The patient’s eyes are observed for thirty seconds for the occurrence of nystagmus. The patient is then returned to the upright position and his or her eyes are observed for thirty seconds for the occurrence of nystagmus. The maneuver is repeated with the head turned to the other side. Horizontal nystagmus (a positive test) usually appears after a few seconds and lasts for less than thirty seconds when the affected ear is in the lower position. Upon repetition of the maneuver, the intensity and duration of nystagmus will diminish, attesting to the fatiguability of the nystagmus in BPPV. A careful neurological examination should also be performed since the presence of neurological abnormalities suggests a central lesion. The ears should be examined, including bedside tests for hearing acuity. Finding vesicles in the external auditory canal suggests the Ramsay-Hunt syndrome. More advanced vestibular testing should be carried out by experienced consultants. 3. Laboratory, radiographic, and other tests that are likely to be useful in diagnosing the cause of this problem. Laboratory testing is not useful in diagnosing the cause of vertigo. Tests that may be useful in patients with vertigo include brain imaging with magnetic resonance imaging (MRI), computed tomography (CT), electronystagmography (ENG), vestibular evoked potentials, audiometry, and brainstem auditory-evoked potentials. Neuroimaging is indicated if the history or physical exam suggests a central origin of vertigo or if a schwannoma is suspected. Neuroimaging should be undertaken if there are risk factors for stroke or if is a headache accompanies the vertigo. MRI and MRA is the preferred method, as it is more sensitive early for stroke and for detecting stenosis or occlusion of the posterior circulation. CT scanning is an alternative if MRI is not available. Vestibular testing is indicated when vertigo doesn’t respond to simple measures, is persistent, or is incapacitating. More advanced vestibular testing should be carried out by experienced consultants. Not applicable, as imaging will give the diagnosis of any structural lesion found, which is beyond the scope of this chapter. 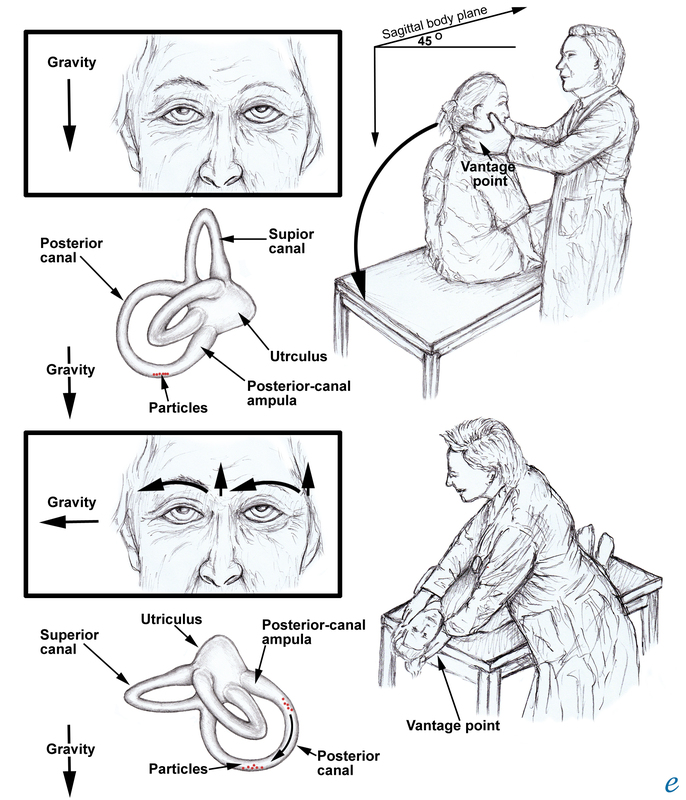 BPPV – The Epley maneuver (seeFigure 2) is designed to relocate the free-floating debris from the posterior canal to the vestibule of the vestibular labyrinth. Severe cervical spine disease and high-grade carotid stenosis are contraindications to using the Epley maneuver. This maneuver may be difficult to carry out in the hospital, as success of the maneuver seems to depend on the patient remaining in the upright position for twenty-four hours. Vestibular suppressants (see below) are not needed in addition to the Epley maneuver, but they could be used in hospitalized patients who are symptomatic until discharge, when performing the Epley maneuver might be more reasonable. Vestibular neuritis – Treatment with corticosteroids (starting at 0.5-1.0 mg/kg and tapering over 10-21 days) during the acute period of vertigo has been shown to improve the recovery of peripheral vestibular function in patients with acute labyrinthitis (Fishman Cochran Database 2011). The addition of anti-herpetic drugs does not improve resolution. Patients may also require symptomatic treatment and vestibular rehabilitation, as outlined below. Meniere’s disease – Acute episodes of vertigo should be managed with vestibular suppressants and antiemetics. Triggers for Meniere’s disease may include high salt intake, caffeine, alcohol, nicotine, stress, monosodium glutamate (MSG), and allergies. Avoidance of these triggers may alleviate or ameliorate symptoms. Diuretics, which are thought to reduce the degree of endolymphatic hydrops, should be used if lifestyle modification is unsuccessful. Ramsay Hunt syndrome – Antiviral therapy for herpes zoster is indicated. Perilymphatic fistula – Treatment begins with bed rest, head elevation, and avoidance of straining. Surgical repair should be considered if symptoms fail to resolve after several weeks of conservative therapy. Cogan’s syndrome – Since this syndrome is thought to be an autoimmune disease, a course of systemic steroids is indicated. Some patients also require immunosuppressive therapy. Patients also benefit from vestibular suppressants. Migrainous vertigo – Acute migraine treatments, such as triptans, may offer benefit, but there are no randomized trials. Vestibular suppressants may also be useful. Vertebrobasilar ischemia – Typical secondary prevention measures for TIA and stroke, such as risk factor modification and antiplatelet therapy, should be considered. Angioplasty and stenting is a treatment option for stenotic lesions of the vertebral artery. Efficacy for these procedures is uncertain, and they are usually considered when maximal medical therapy has failed. Acoustic neuroma – Surgery, radiation therapy, and observation are possible treatment options that should be decided upon in consultation with surgical colleagues. Most patients don’t have significant vertigo, negating the need for symptomatic therapy. Multiple sclerosis – Treatment should proceed in consultation with a neurologist. Suppressing vestibular symptoms: Three classes of drugs can be used to suppress vestibular symptoms. These medications are effective in ameliorating acute vertigo but should be stopped as soon as symptoms abate to avoid compromising the brain’s long-term adaptation to vestibular loss. Antihistamines are the drugs of choice. Meclizine (25-100 mg/day in divided doses) is usually used, but diphenhydramine (25-50 mg every 6-8 hours) and dimenhydrinate (50-100 mg every 4-6 hours, not to exceed 400 mg/day) are also effective. Response is dose-related, so titration may be necessary. Meclizine is the drug of choice for pregnant patients. Phenothiazine antiemeticsare more sedating than antihistamines and are usually reserved for patients with severe vomiting. Benzodiazepinesare also sedating and are typically given to patients with contraindications to anticholinergics, such as prostatism and glaucoma. Vestibular rehabilitation:Clinical recovery of vestibular symptoms occurs prior to true recovery of vestibular function because of compensation by the central nervous system. Vestibular rehabilitation promotes recovery in patients with permanent unilateral or bilateral peripheral vestibular hypofunction but might be of less benefit for central disorders. Patient instruction on vestibular exercises should be made in consultation with physical therapy. Except for sedation, the side effects of drugs used to suppress vestibular symptoms are minimal. Extrapyramidal symptoms are a risk with phenothiazine antiemetics and metoclopramide, but less so with domperidone. Anticholinergic agents can cause urinary retention and dry mouth.